Many students always wish for a study abroad opportunity because of the many benefits that it has. Those who are lucky to go abroad for studies even for a short period will get the excitement of experiencing a new culture and new people and way of life. Studying abroad for summer, semester or a longer exchange program gives students an opportunity to immerse themselves in an entire culture for a period of time. Study abroad programs in Turkey have become very popular and fill up quickly because of the high number of students who are increasingly applying for these programs. The recent economic performance of Turkey in the last few years has created an optimistic environment for economic activities and academics. The number of academic institutions has also increased in the last decade which gives more opportunities for study abroad programs. The city of Istanbul is Turkey’s capital and is a cosmopolitan city that has all kinds of entertainments and full of culture. The people of Turkey are very welcoming and the educational system is competitive and tuition fee is relatively affordable. Living expenses are also affordable and students can work while studying. There are many universities in Turkey that offer study abroad programs. The executors of these programs guide students during the entire application process including applying for Turkish visas. There are different study abroad programs in Turkey with varied requirements. Students have the liberty to choose the most suitable program and university for them. There are several top study abroad programs in Turkey offering different opportunities to students all over the world to study abroad. 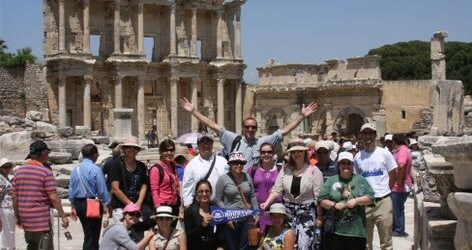 The two most common study abroad programs in Turkey are the summer study abroad sessions and the semester or yearlong exchange programs. There are some top Turkish universities and colleges that offer study abroad programs in these two categories. • Bogazici University is in partnership with several universities offering study abroad programs in this category. The universities include Colombia University, Duke University, George Washington University and Georgia State University. Summer programs are mostly offered by Universities from all over the world but they partner with a contact in Turkey or a University in Turkey. For example most American Universities offering summer study abroad programs have their contacts in Turkey who will be with students throughout the whole session or they have partnered with Bogazici University to conduct their summer study abroad programs. Students who are interested in study abroad programs in Turkey can applied through the programs and universities listed above because they offer the best study abroad experiences for students.